Have a hassle-free Balinese escapade with convenient hotel round trip transfers! Lunch is included in the tour, the falls was nice it was just too crowded. 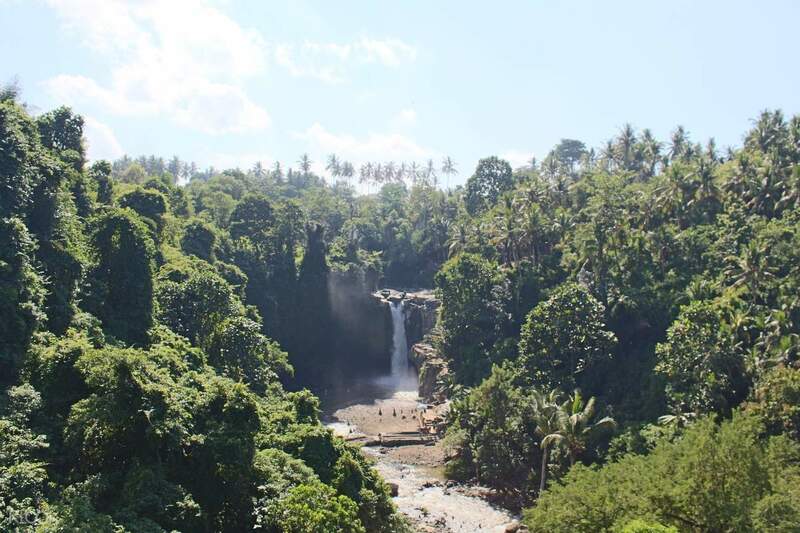 An authentic Bali experience won’t be complete without a tour of the exotic landscapes and attractions in Ubud. Gifted with natural wonders, cascading waterfalls, and lush rice terraces, Ubud is home to Bali’s rich culture and heritage. Plunge into the heart of Ubud by going first to the famous Bali Swing. Get on a natural high and breeze through an epic jungle backdrop in this thrilling activity from high above. Try out the single and tandem swings and have an amazing view while swaying through the air. 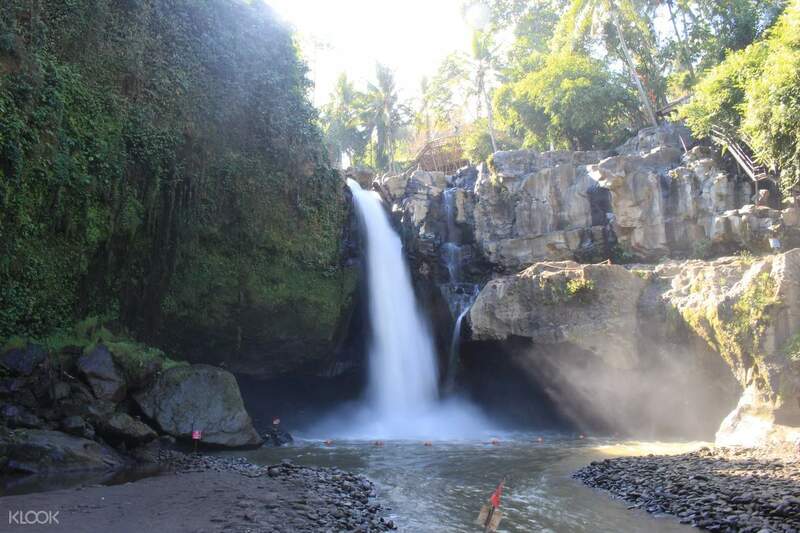 In the afternoon, you will be brought to Tegenungan Waterfall where you'll get to see this mighty sight of heavy, flowing waters surrounded by a dense green valley is a natural masterpiece. You can have a good view of it on restaurants perched above or trek down to feel its exquisite waters. Relax after a day of exploring Ubud with a convenient transfer back to your hotel. Hop on the famous Bali Swing, which is sure to give you an adrenaline rush! We enjoy the whole trip so much !! The driver Butu is so friendly and even keep waiting us during the whole day. Free entrance to both swing and waterfall. The air cond in car was cold as raining during the return way. Please do remember bring a hat or cap and sunglasses to Bali swing. It’s too sunny there! Enjoy ! We enjoy the whole trip so much !! The driver Butu is so friendly and even keep waiting us during the whole day. Free entrance to both swing and waterfall. The air cond in car was cold as raining during the return way. Please do remember bring a hat or cap and sunglasses to Bali swing. It’s too sunny there! Enjoy ! Driver picked us up on time. It was about a 5-10mins waiting time per person per swing. The queue for the swings were not too long so we didn't had to wait for a very long time. Lunch was included! We paid about 10USD (can't remember the exact) per person and there are photographers to help us take pictures but the pictures can be better. At the end of the trip we asked our guide if he could drop us off at the Finn's Beach Bar (quite a distance from our villa) and he kindly agreed. Overall satisfied with the day's itinerary. Driver picked us up on time. It was about a 5-10mins waiting time per person per swing. The queue for the swings were not too long so we didn't had to wait for a very long time. Lunch was included! We paid about 10USD (can't remember the exact) per person and there are photographers to help us take pictures but the pictures can be better. At the end of the trip we asked our guide if he could drop us off at the Finn's Beach Bar (quite a distance from our villa) and he kindly agreed. Overall satisfied with the day's itinerary. The place and tour guide are so helpful and kind. Tour was so good, the place and food was nice. I love the bali swing because im fee relax when i did the activity.Nice shot Bali Swing. The place and tour guide are so helpful and kind. Tour was so good, the place and food was nice. I love the bali swing because im fee relax when i did the activity.Nice shot Bali Swing. My first time in Ubud and excited about the swing. Arrived safely and snapped many pics before a heavy pour. Due to the heavy rain, we could not make it for the waterfall and headed back to hotel and shopping. My first time in Ubud and excited about the swing. Arrived safely and snapped many pics before a heavy pour. Due to the heavy rain, we could not make it for the waterfall and headed back to hotel and shopping. The activity is very nice. I love the scenery. And the staff were very professional. The activity is very nice. I love the scenery. And the staff were very professional. Swing was an amazing experience. Enjoyed the scenic view of Bali. Swing was an amazing experience. Enjoyed the scenic view of Bali. Its a great experience. I totally recommend it. I had lots of fun taking photos. Its a great experience. I totally recommend it. I had lots of fun taking photos. Worth the value since entrance ticket is included. Less hassle of getting the tickets over the counter. Very safe place. Every swing and love nest have their safety gear and staff to assist. Waterfall is awesome and relaxing place to be. Steps are challenging but it's testing one's stamina. Truly enjoy both sites. Thanks Klook! Worth the value since entrance ticket is included. Less hassle of getting the tickets over the counter. Very safe place. Every swing and love nest have their safety gear and staff to assist. Waterfall is awesome and relaxing place to be. Steps are challenging but it's testing one's stamina. Truly enjoy both sites. Thanks Klook! We had a transfer arranged and was picked up on time. The drive was an hour to the swing and we had unlimited opportunities to take photos. The place had an option of having DSLR photos taken which I took at a reasonable price. Buffet food was served in the area which by far, the best food I’ve had in Bali. This tour is absolutely worth it! We had a transfer arranged and was picked up on time. The drive was an hour to the swing and we had unlimited opportunities to take photos. The place had an option of having DSLR photos taken which I took at a reasonable price. Buffet food was served in the area which by far, the best food I’ve had in Bali. This tour is absolutely worth it!